More Backyards Than Time…Where Did Summer Go? So many backyards. So little time. And now…its Labor Day weekend already. Where did the summer go? Its been a big year for Archadeck of Central Iowa. We started off fast with a very mild Winter and a balmy Spring. Then, Summer got hot, and so did demand for our custom-designed and built outdoor living spaces. 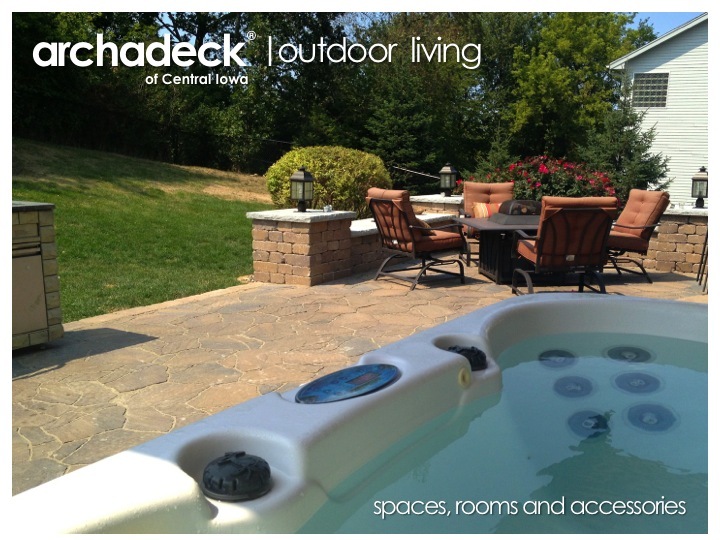 So we sweated through it and many folks around Des Moines and Central Iowa are enjoying their new outdoor living spaces. The Davis’ in Grinnell have a peaceful space with a new screen porch and patio built around their existing garden and water feature areas. The outdoor kitchen we integrated into their patio offers a great space for cooking and preparing the harvest from their gardening efforts. The Lytle’s in Urbandale have a new backyard paradise complete with a low-maintenance wood-alternative deck and Belgard Mega Arbel patio. This space is accessorized with stone seat walls, a gas firepit, an outdoor kitchen, a hot tub and a low-voltage lighting system for nighttime ambiance. The Lytle’s christened their new backyard paradise by hosting their daughter’s wedding reception on the patio. 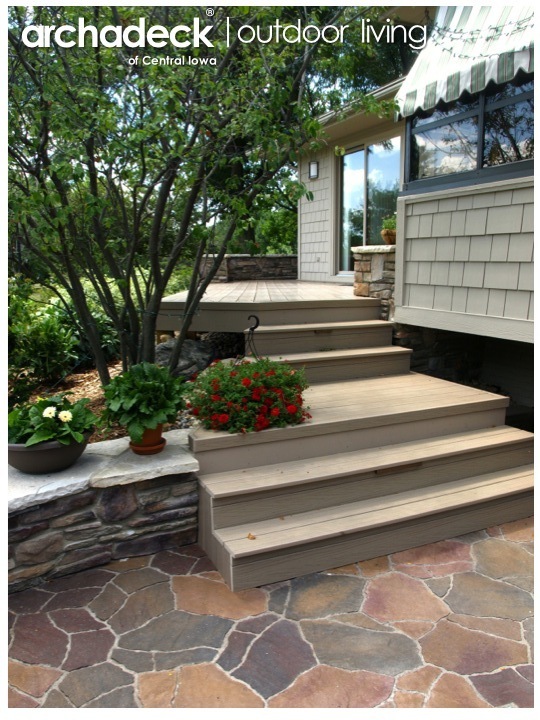 The Glenn’s in Johnston replaced their deck with a completely hardscaped outdoor living space. Their patio, too, features Belgard Mega Arbel pavers, a lighted corner wall area for their firepit seating group and a bar/counter integrated with their existing outdoor kitchen. 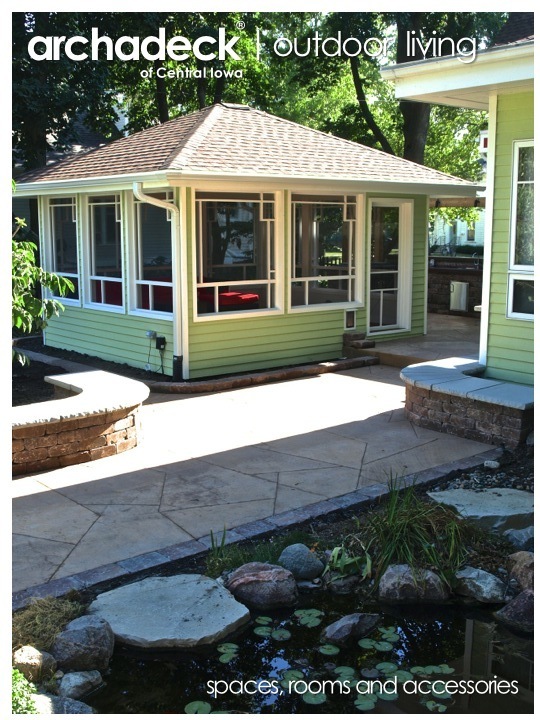 The design we created also relocated their hot tub in a more convenient location. Someone celebrated a significant birthday on the patio shortly after our completion. Who and which one will remain our secret. What happens on an Archadeck patio, stays on an Archadeck patio. Of course, those aren’t the only three projects we’ve done, but in the interest of time…those three projects cover a lot of ground. Literally. Not only am I behind writing about our outdoor living projects, I’m also behind in getting pictures from these projects and getting those pictures into the photo galleries in our web site. So stay tuned and check our web site often. Obviously, I have some pictures – but not as “clean” or organized as I would like. So what you see above are the first ones published from these outdoor living projects – an exclusive for you, our patient blog readers! Pinterest – For those of you not familiar with Pinterest yet, its an on-line pinboard application that allows you to “pin” and organize pictures (and related articles) found on internet sites for future reference. I plan to get a Pinterest site set up for Archadeck of Central Iowa in the coming weeks. But, in the meantime, feel free to follow my personal Pinterest site, HaroldCross. While “personal,” I’m primarily using it to learn about Pinterest and how/if it can benefit my Archadeck business so it has a real “outdoor living” feel to it. I’ve started some collections (boards) of pictures I’ve saved – outside of Archadeck sites – that I can use for design inspiration and ideas in our custom design process. So, if you want to get a sense of things I like – besides Archadeck spaces and structures – check out my personal Pinterest site. Feel free to re-pin from there or to pin pictures from our deck , porch and patio galleries in the Archadeck of Central Iowa web site. Photosynth – Now this is really cool! A prospective client I talked to about a screen porch project on the south side of Des Moines turned me on to this….thank you! Photosynch is a Microsoft-supported app that allows you to take panoramic photos and then upload, organize and present those panoramic views via a web site. And by “panoramic,” I mean…panoramic! 360-degree (as soon as I figure that out), interactive zoom and rotation, horizontal/vertical scrolling…make yourself as dizzy as you want! I’m on an experimental basis here, too…and still “practicing” with the techniques to get decent results. But, I’ve got an Archadeck of Central Iowa public Photosynth site set up with views from a Des Moines deck, patio and open porch project we did in 2008…in my backyard (facilitates the experiment). If you’re willing to follow my experiment, check it out (click the links here or search Archadeck_Central_Iowa on the Photosynth home page)…and watch for future panoramic views of other Central Iowa backyards. I think this is going to be really fun! We’ve accomplished much more in backyards around the Des Moines area this Summer and more projects remain to be built. But hopefully this fills in the gap a bit. Thanks for your patience and loyal following. Stay tuned, I’ll fill in more gaps with more Archadeck designed and built outdoor living space project news as Summer fades to Fall. In the meantime, we wish you an enjoyable Labor Day weekend and a nice (cooler!) Fall season of outdoor living. This entry was posted in Deck Lighting, Decks and Decking, Fireplaces, Hot Tubs and Spas, Landscaping, Outdoor Kitchens, Outdoor Living, Patios, Porches, PVC Decking, Screen Porches, Wood-Alternative Decking. Bookmark the permalink.